I’ve attempted making pickles before, with mixed success. Here’s my latest bash at it, an easy recipe requiring very little preparation OR waiting time. I find that the recipes requiring you to drain the cucumbers by salting first actually make soggy pickles. This recipe’s a good ‘un and will make one jar of nice crunchy ones. In a large bowl, mix together the vinegar, sugar, salt, pickling spice and peppercorns. Pour over the hot water and mix until the sugar is dissolved. Let this mixture cool to room temperature. Put the sliced cucumber, onion, garlic and bay leaf into your pickle jar, and pour the cooled pickling liquid over the cucumbers. 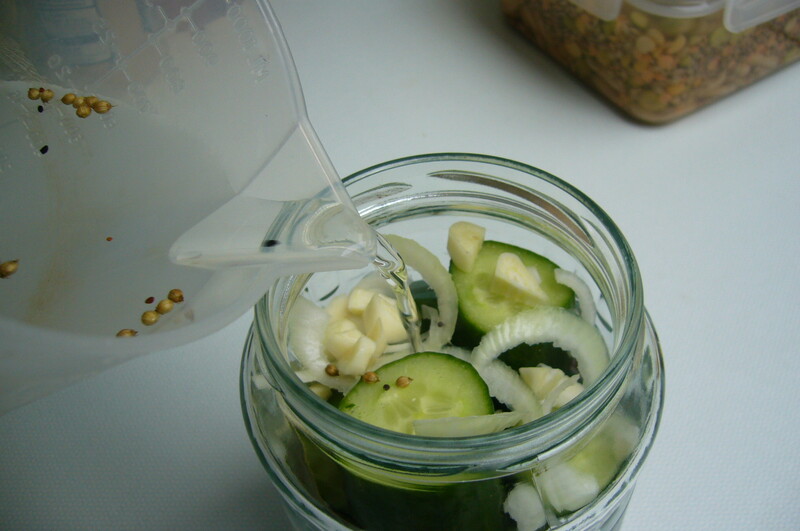 If the liquid doesn’t quite cover the cucumbers, top it up with a bit of water. Place the jar in the fridge and wait in anticipation for 24 hours before they are ready to start munching on. Apparently they’ll keep for two weeks, but I just love pickles and they always disappear pretty quickly!